Chamonix was buzzing with so many runners (around 5000) waiting to start their run over the festival and the UTMB runners played the longest waiting game, which gave me a chance to soak up the atmosphere for a couple of days, sight-see, rest, ponder the run profile, decide on whether to go with a new pair of shoes or trust the worn-in favourites which were lacking some traction and had me a bit worried about if the trail was to be wet, pack and re-pack my run bag and poles or no poles. I was excited! The Mont Blanc Massif is spectacular and I was about to run around it with the weather forecast being perfect! So Friday 30th of August was race day and the UTMB didn’t start til 4:30pm, yet another day of waiting. I was registered, packed, my support crew (Angela, Anthony and my mum) had mastered my haphazard attempt of a spread sheet with potential checkpoint times and sorted out when they could use the car and buses during the race. By 4:00pm I was lined up in the sun, within the departure area and with most of the other 2300 runners there it was a crazy place to be. 4:30pm, we started! And the shuffle down the main street of Chamonix with the crowd cheering began! A few kms down the road, the field had spaced out and we were able to all to begin jogging and find our own pace. My first surprise is just how quiet everyone is, there’s not much talking on the trail, and I think everyone was contemplating what lied ahead. A few people say ‘hello’, a few commented ‘you came all the way from Australia, for UTMB?’ I answer ‘Yes, it’s a great excuse for a holiday’ they answered, ‘you crazy, you Australie!’. It was long until the first hills can up on the course and I started to move up past people in the field. Running where it wasn’t too steep and walking on those sections I needed too. I bump into Michael Hughes, “I’m the one that led you down the wrong track at GNW last year”, “Ahh…, I know you then”. I kept heading up hill (no poles), decided to leave these at the hotel, and the next Aussie to appear was Shona Stephenson, ‘Happy Birthday’ and I kept going pass her. I knew I would see these guys again. 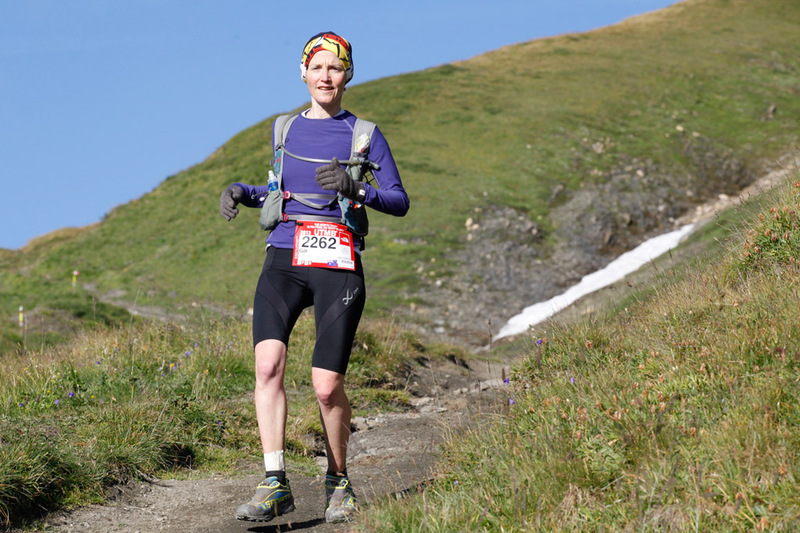 On the first big descent into St Gervais I got a little over excited, people went racing past, including Michael and Shona, so I picked up my speed, something my quads regretted for the rest of the run, before going back to my own run plan. When I came into Les Contamines, a quick hello to my support crew, and I was on my way again, up to Croix du Bonhomme (44km, 2443m) with the dark creeping up on me I was struggling a bit with my food. I hadn’t been eating enough and was feeling nauseous, something that I usually escape on runs, but not this time. Still making reasonable progress, even if it didn’t feel like it I remembered I had a pack of Chomps and these saved me towards the top of the hill! 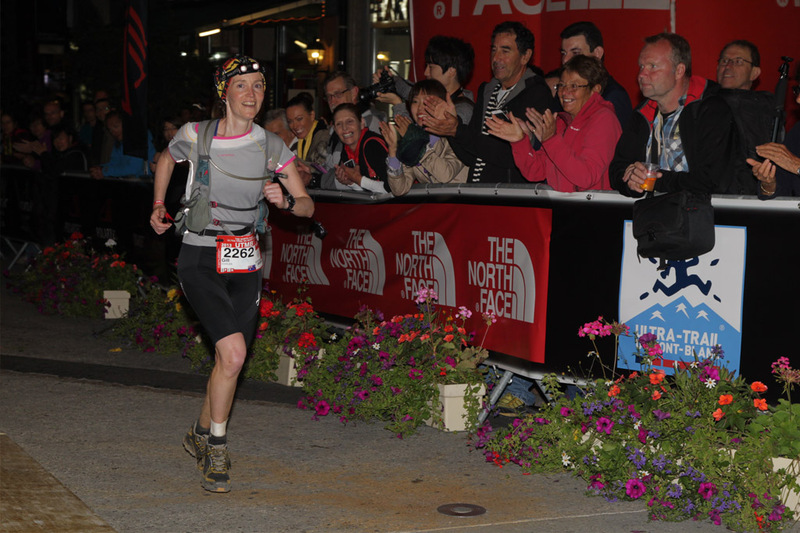 Feeling strong again for the 5km run down into Le Chapieux, my smile was back and I felt alive and strong again, ready to enjoy the night and start the next climb. On the UTMB there are checkpoints every 5 to 10km, so you’re never far from these lively places, filled with volunteers and people cheering. Orange segments, prunes and coke were my food of choice; these supplemented the energy bars & gels I was carrying in my bag, although the gels weren’t going down well on this run. The local fromage & salami was hard to pass up, along with the dishes of hot food, but I opted not to eat these. Night had set in, runners had become more sparse, and I settled into the climbing and descending. The trail condition was good, never too rocky and every so often I turned around to see the line of torch lights trail off into the distance. It was a fun to run and the steep! descent into Courmayeur, checkpoint at 77km, where my mum was waiting in the middle of the night was a welcoming sight. I was glad she pushed her way into the waiting area assuring the volunteers I was near (she was right, of course). This is where I saw Silvia, the girl in front of me, for the first time and her plate of pasta was quickly left when I entered. I had a strong climb out of Courmayeur and luckily for me someone to follow out of town as this section was a bit confusing. Silvia was never too far behind and she passed me on the descent into Arnuva (94km) at dawn. As the sun rose I could see for the first time the amazing Mont Blanc Massif from the Italian side and I had to keep telling myself, “look at the track, not the view, keep running!” otherwise I’d be flat on face. Another speedy person in a blue-jacket ran past on the way into Arnuva. I was quite surprised, when I entered the checkpoint that it was Andrew Tuckey. He’d recouped after a bad night with a small sleep at Courmayeur and after saying our hellos, good lucks and goodbyes I watched him fly up Grand Col Ferret. Col Ferret was a big climb, but the most spectacular part of the race in the early morning and after you have reached the top it is a gentle downhill run for nearly 20km. I pondered whether poles would have helped with these climbs? But without any practice, I’d stuck to what I knew best and left them in Chamonix. Each downhill run got a bit harder and it took me 5mins at the start of each descent for my legs to warm into it. 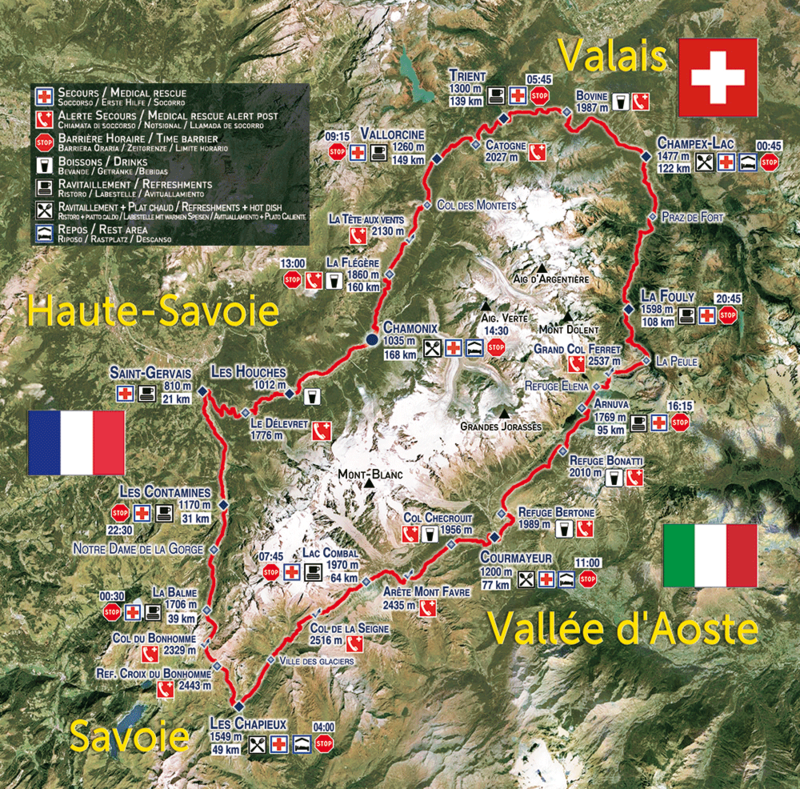 The next checkpoint for support crew was Champex-Lac (122km), where Angela & Anthony would be waiting. There was a small climb after the long downhill into this checkpoint and it sapped me! I expected it to be an easy climb and it just seemed to keep going and going and going! I knew I needed more food again, as I had three more mountains to climb and they were bigger than this one, arriving at Champex-Lac to find my full support crew contingent cheering. Mum was too excited to sleep, so she had gotten back on a bus with Ange and Ant to come out and continue cheering, with hardly any sleep. After Champex-Lac I felt stronger again and had made sure I was eating food before leaving, even changed shoes. At this point I started to count down the hills and knew I’d see my support crew in each valley from here. The climbing and descending was good, the ascents now were a fast walk, and the descents, whilst painful on the legs, I could move as I had gravity on my side (although maybe a bit more down-hill training would have helped, note for next time). It was the flat sections that were the hardest as I knew I should be running them, but my legs felt like lead. Out of Vallorcine, there was a few km’s of ‘relatively’ flat fire-trail before the final climb, but my legs wouldn’t run. This final climb of the run up to la Flegere was pretty tough, much rockier than the last two, which I had powered up and down. The climb from Trient to Vallorcine I was really happy with as the group of guys I had been playing leap-frog with on the ascents hadn’t caught me, but by the top of that last climb to la Flegere they had caught me again and whilst they tried to get me to run with them for the last 10km to Chamonix, my legs were not moving as well as theirs on the descents. The sun was starting to set and at the top near La Flegere I had the view of the Mont Blanc massive again. I knew there wasn’t long to go, my pace had slowed, self-preservation had started to kick-in and I knew I’d get to the finish line, it was just a matter of time. Wasn’t going to make it by dark, the torch was back out for the descent through the trees, and then finally the last km or so through town with the cheering crowds to the finish line! I had done it! 28 hours, 50 mins thought 28 hours may have been achievable around the 100km point, but my pace had slowed in the last 40kms or so, and time didn’t seem urgent, whilst the legs were sore, I was enjoying the trail and the views, just as long as the finish line eventually appeared. 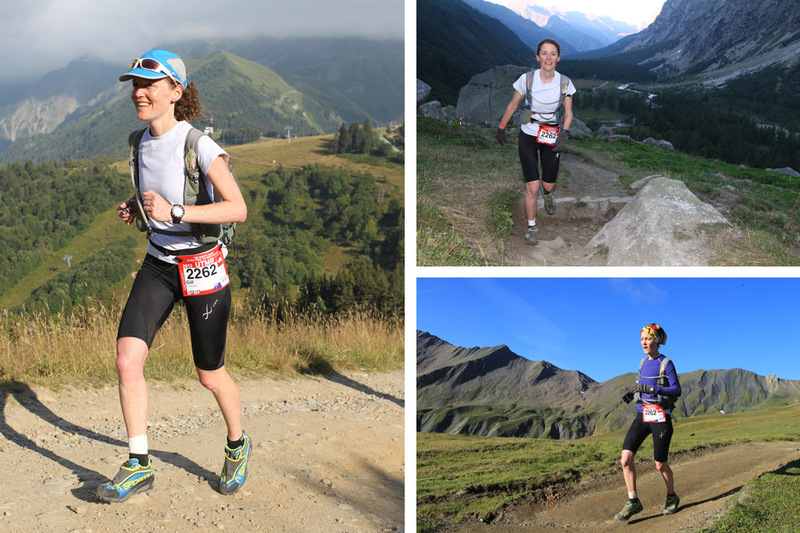 UTMB is a truly amazing run; the organisation that goes into the event is phenomenal. There are so many people that take part to push themselves and tackle these mountains it was fantastic to be a part of it.